WARNING: Senate District 16: Towns of Bow, Candia, Dunbarton, Hooksett and Wards 1, 2 and 12 in Manchester. PARENTS URGENT WARNING, you have a candidate for New Hampshire Senate who has been actively working against your children! Scott McGilvray is running for New Hampshire Senate in District 16. 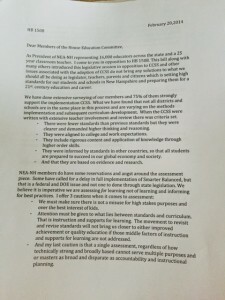 As the president of the NEA-New Hampshire, many teachers are disappointed with the NEA’s support of Common Core. Not only did the NEA let the teachers down, this teacher blogs about the pay-off to support Common Core. We do NOT need a rubber stamp in Concord working against parents, students and teachers. There is a good alternative, J.R. Hoell. As a representative, J.R. Hoell has not only advocated for quality academic standards in our public schools, he’s been supportive of parental rights. Rep. Hoell introduced legislation a few years ago that gave parents the right to opt out of objectionable material. Rep. Hoell has proven to be a champion for public education and parental rights. Parents you have the proof so now it’s time to make sure you inform your neighbors and friends who really supports students, parents and public education in New Hampshire. It’s NOT Scott McGilvary. UPDATE: Joe Duarte is running for Senate in District 16 and is a far better choice for voters in BOW, DUNBARTON, HOOKSETT and parts of MANCHESTER. This entry was posted in Academic Standards and tagged JRHoell, NEA, NEA-NH, ScottMcGilvray, Senate, SenateDistrict16 on May 19, 2016 by SCC. Governor Jeb Bush came to New Hampshire a few weeks ago and told us why we should support the re-authorization of No Child Left Behind NCLB. Many teachers and parents were shocked to learn the Governor not only supports the Common Core Standards in our schools, but now he’s trying to get us to support re-authorizing No Child Left Behind. At what point do we say, he’s out of touch? Did he even read HR5 for instance? All 600 pages PLUS? And if so did he read about the many problems in the Bill that will continue to plague our local schools? How can Jeb Bush ever be trusted as President if he is that out of touch with the parents in New Hampshire who’ve had to endure the failures of No Child Left Behind and the current problems with Common Core? 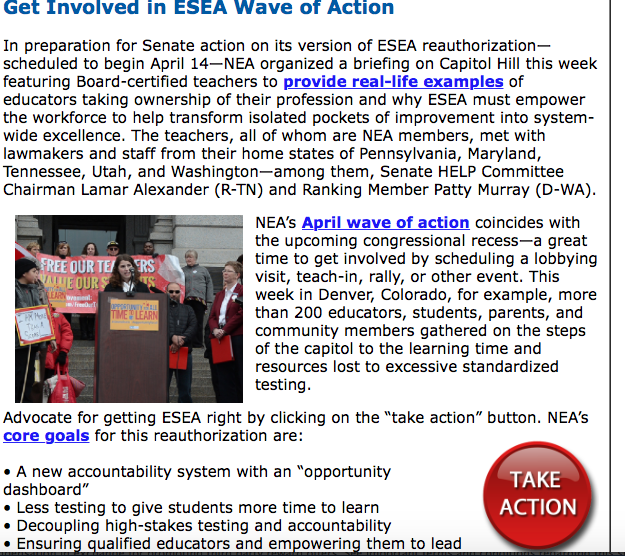 To make matters worse, now the NEA is teaming up with Governor Bush to push for reauthorizing NCLB too. Yes you read that right. 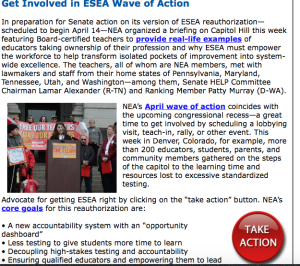 The nations teachers union, instead of calling for repealing the law, they too want to re-authorize it in their way. Their recent e-mail to teachers referenced the Senate version of NCLB however many of the problems in the House version, continue in the Senate version too. No where does the NEA call for accountability to PARENTS. Right now this accountability scheme is to bureaucrats. No where do they call for the repeal of NCLB. They simply want to re-work it and pass it. We’d like to see Governor Bush and the NEA to start putting parents back in control of their local schools. NCLB and the current proposed legislation continue to leave parents out. Teachers and parents are fed up with the over-reach by the federal government into our schools. We do not need an out-of-touch Governor and the union leadership joining together in an effort to re-authorize legislation that continues to cut parents out of the picture. This entry was posted in Candidates, Legislation and tagged ESEA, HR5, JebBush, NCLB, NEA, reauthorization, SenatorLamarAlexander on March 29, 2015 by SCC. 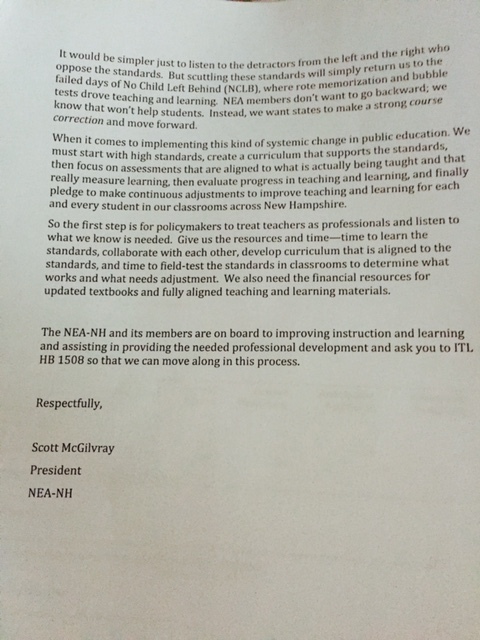 NEA-NH: A Voice For Teachers ? Teachers in NH, are you being well served by your union representation? IF not, please make sure you are letting them know where you stand on Common Core and the Smarter Balanced Assessment. Last year we had an opportunity to withdraw from Common Core and all of the harmful practices we are seeing from this reform. 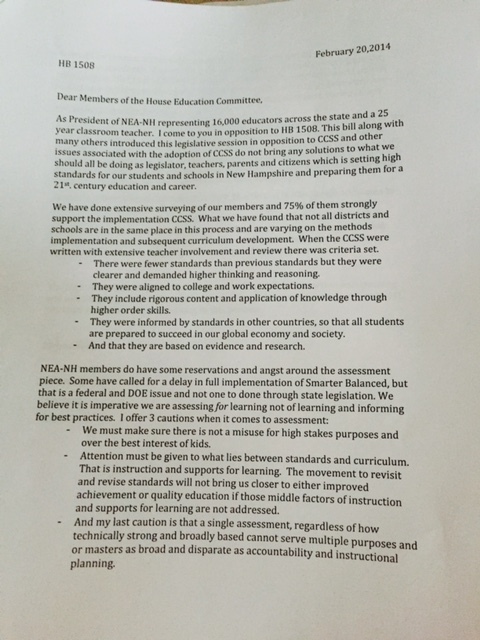 However NEA-NH chose to oppose that legislation. FIRST: ask how much NEA-NH gave to Governor Hassan’s campaign for Governor and then ask yourself, are you being well served. 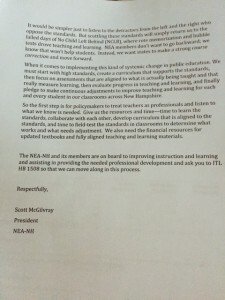 This entry was posted in Political, Teachers and tagged HB1508, McGilvray, NEA, NEA-NH, NH, Scott on March 4, 2015 by Admin. Governor Hassan continues to stand against teachers and for Corporate Interests. The NEA Representative Assembly joins other educators and parents in CALLING FOR THE RESIGNATION of U.S. Education Secretary Arne Duncan for the Department’s failed education agenda focused on more high-stakes testing, grading and PITTING public school children against each other based on test scores and for continuing to promote policies and decisions that undermine public schools and colleges, the teaching profession, education professionals and education unions. This entry was posted in Teachers and tagged Arne, California, Duncan, NEA, Resignation on July 4, 2014 by Admin.